Cut all the buns horizontally from centre. Take a tawa/griddle and heat it. Put ½ teaspoon oil and roast the bun on both the sides till it is light brown and crisp. Put the gas on medium to low flame otherwise bun will burn. Roast all the buns and keep it aside. You can use bread slice also. Take a bowl. Add curd, salt, sugar and mix it well. Keep it in the refrigerator and chill it. For serving – Cut four pieces from each bun. Take a bowl and spread bun pieces. Pour chilled curd on it. Sprinkle cumin powder, red chilly powder and garam masala. 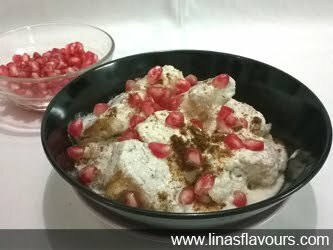 Sprinkle pomegranate seeds on the top and serve it immediately.